The text on this page was used for the application for ADHO approval for the foundation of the AVinDH SIG. The field of Digital Humanities is strongly focused on textual sources, whereas audiovisual material seems to be the biggest wave of data to come in the near future (Smith, 2013). This claim is supported by a prospective study conducted by IBM on how the flow of digital data will evolve in the coming two decades. 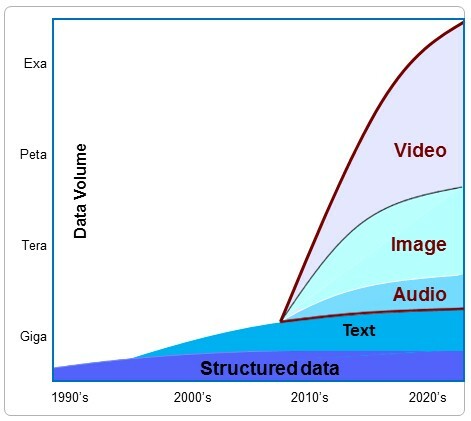 As can be seen in Figure 1 below, the production of video, images and audio, will result in exabytes of data in the coming decades, both due to the increased production of digital-born data and the massive digitization of analogue sources. Consequently, audiovisual datasets hold the promise of truly big data becoming available to academic researchers. Audiovisual sources have a potentially huge value for the Digital Humanities as they are multi-layered. A single document can provide information regarding language, emotions, speech acts, narrative plots and references to people, places and events. This richness provides interesting data for various disciplines and can therefore stimulate multidisciplinary collaboration between researchers from computer sciences, social sciences and humanities. In spite of this potential, the use of audiovisual data by scholars is still in its infancy. Sources such as television, film, photos and sound recordings, although omnipresent in our daily lives, are not as ubiquitous in academic research as written sources. There are a number of explanations for this discrepancy. The first is the relatively young age of these sources compared to the textual tradition. This is reflected in skepticism about the value of (moving) images and sound for academic research outside a relatively small community of specialists in media studies. Secondly, the commercial value of many audiovisual sources results in considerable constraints with regard to re-use due to issues of copyright. Thirdly, analyzing audiovisual sources is quite time consuming due to the linear structure and dynamic nature of most of the material. Finally, no widespread accepted digital research methodology for the exploration and analysis of audiovisual content in a data-driven manner exists as of yet. In fact, data modelling based on the study of patterns and trends that can be discerned in the various semantic layers of audiovisual (sub)collections has only just begun to gain attention. Unlike scholars who study text and have a multitude of refined tools at their disposal, researchers specialised in audiovisual materials have not much to choose from. This calls for consolidating efforts and setting a research and policy agenda with audiovisual data and archives at the core. Setting up a dedicated website & mailinglist for communication purposes, including the dissemination of relevant information on events, conferences, projects, courses, etc. Exploring opportunities to jointly apply for national, EU(H2020) or international funding for infrastructural support. Bailey, C., Gardiner,H., Bailey, C., (2010). Revisualizing Visual Culture. Brookfield, USA. Christel, M., & Frisch, M. (2008). Evaluating the contributions of video representation for a life oral history collection. In: Proceedings of the 8th ACM/IEEE-CS joint conference on Digital Libraries (JCDL2008), 241-250. Fickers, A. (2012). Towards A New Digital Historicism? Doing History in the Age of Abundance. VIEW Journal of European Television History and Culture, 1(1), 19–26. Freund, A., (2009). Oral History as Process-generated data. Historical Social Research, 34 (1): 22-48. Truong, K.P. and Westerhof, G.J. and Lamers, S. and de Jong, F.M.G. and Sools, A. (2013). Emotional expression in oral history narratives: comparing results of automated verbal and nonverbal analyses. In: Proceedings of the Workshop on Computational Models of Narrative, CMN 2013, 4-6 Aug 2013, Hamburg, Germany.pp.310-314.